Its name refers to the "Trellises" of diamonds that criss-cross its surface. After the death of Alexander III, his son Czar Nicholas II carried on the tradition of giving a jewelled egg to the Czarina, Alexandra Fyodorovna. The background has a machine-turned, all-over textured pattern in transparent light green enamel. The trellis, set with rose-cut diamonds, contours the egg and is topped by a large diamond. In between the trellis are roses enameled in shades of pink, with vinelike branches in gold and leaves of dark green enamel. 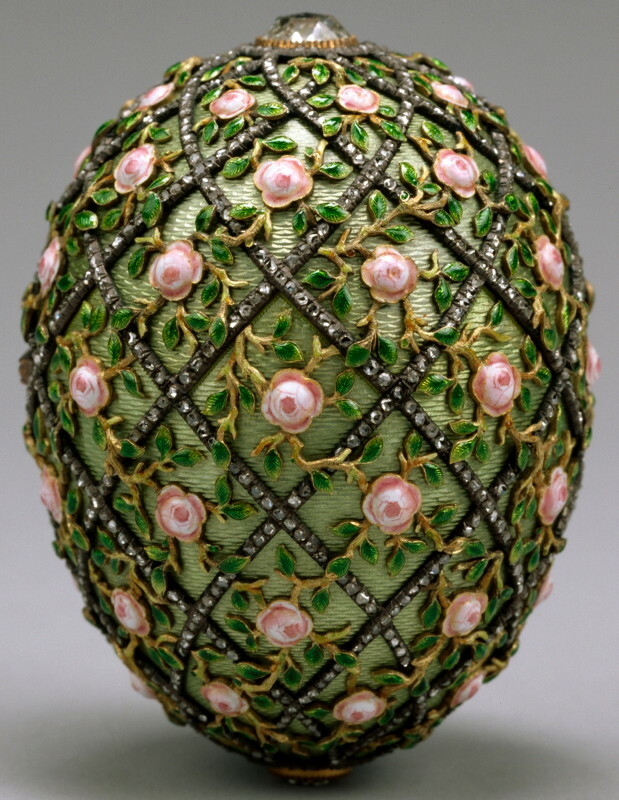 This beautiful gold Easter egg is enameled in translucent pale green and latticed with rose-cut diamonds and decorated with opaque light and dark pink enamel roses and emerald green leaves. A portrait diamond is set at either end of this Egg, the one at the base covering the date "1907". Unfortunately the monogram, that probably was under the portrait diamond at the other end, has now disappeared. Originally the Egg contained an oval jeweled locket in which the surprise was hidden. Only the impression on the satin lining now remains. Research indicates the surprise was a diamond chain with a watercolor miniature of the little Tsarevich Alexei, painted on ivory.